SXN1001 - an NPN bipolar transistor SXOA1000 - an opamp. Open windows explorer or click on My Computer or open other file manager of your choice. Select the * Recently Added Models * category from the top of list shown on the left hand side. Press Place to place the device on the schematic. Without you having to tell it, SIMetrix already knew that the SXN1001 is an NPN transistor. This is because it is a primitive device defined using a .MODEL control. Such devices are built in to the simulator and SIMetrix can determine the part type simply by reading the .MODEL control in TUTORIAL3.MOD. This is not the case with the other device in the model library. This is an opamp and is defined as a subcircuit. This is a module made up of other parts, in this case BJTs, diodes, resistors and current sources. SIMetrix can't tell what type of device this is. It knows that it has five terminals and it knows where the electrical model is located in the file system, but it doesn't know what schematic symbol to use for this model. 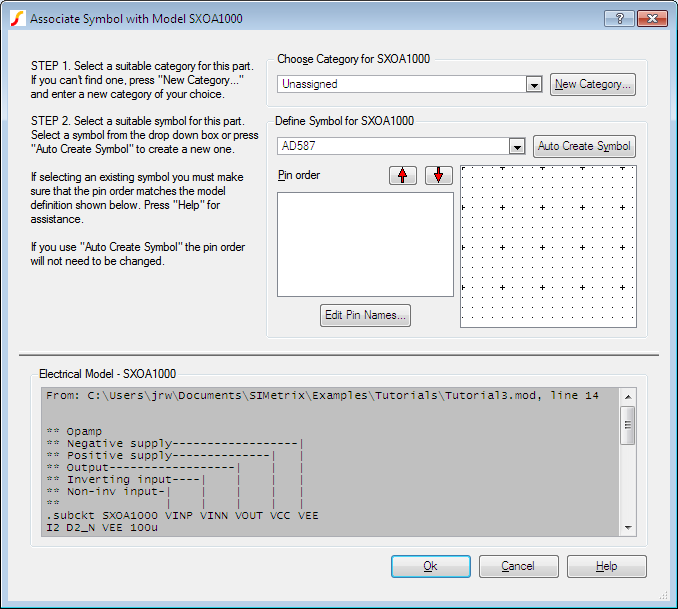 Repeat the steps 1-5 above but instead select the SXOA1000 device instead of the SXN1000. Notice that when you select the device in the right hand side, you see the message SIMetrix does not know what symbol to use for this model. Press "Place" to resolve. First specify a suitable category for the device. In this case it is an operational amplifier, so select Op-amps from the drop down box labelled Choose Category for SXOA1000. Next define a symbol for this part. 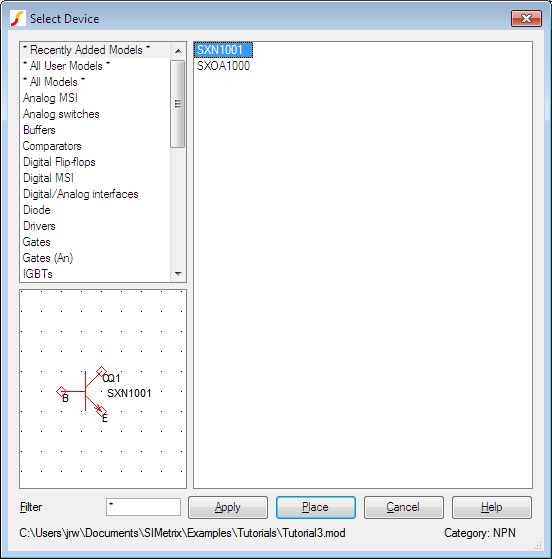 Under Define Symbol for SXOA1000 select Operational Amplifier - 5 terminal. Select out in the pin order box. You will now find our op-amp listed under the Op-amps category in the model library browser. 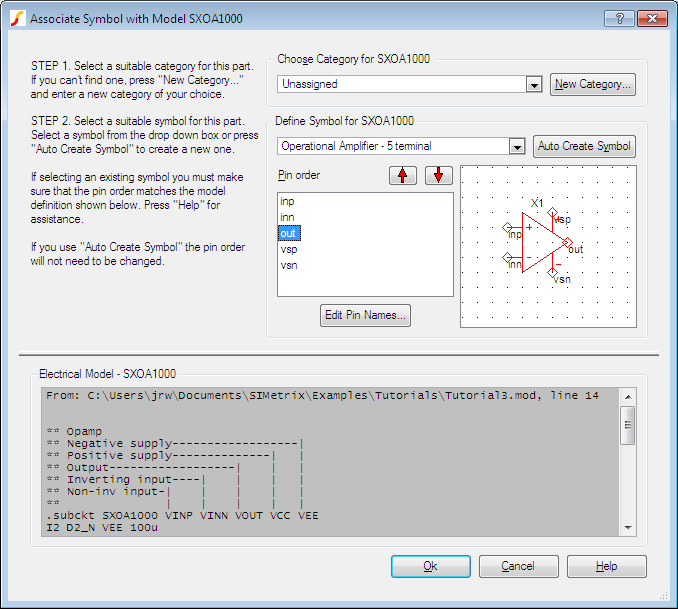 You will not always need to execute the above procedure to associate models and symbols even for subcircuit devices. SIMetrix is supplied with a data base of over 40000 devices that are already associated. These are devices for which SPICE models are known to be available from some third party source. This database is in the file all.cat which you will find in 'support\ devdb' directory. The information you enter in the associate models dialog is stored in a file called user_v2.cat which you will find in devdb/user under the application data directory - see Application Data Directory. You will also not need to perform the above procedure for many 2 and 3 terminal semiconductor parts even if they are not listed in the all.cat database. SIMetrix runs a series of simulations on these models and attempts to determine what the device type is from their results. If successful, the 'association' step demonstrated above will be skipped. Finally, there is a method of embedding association information within the model itself, and such models will not require manual association. The embedding method is described in Embedded Association.